I made the excuse plenty of times, “I can’t do it. 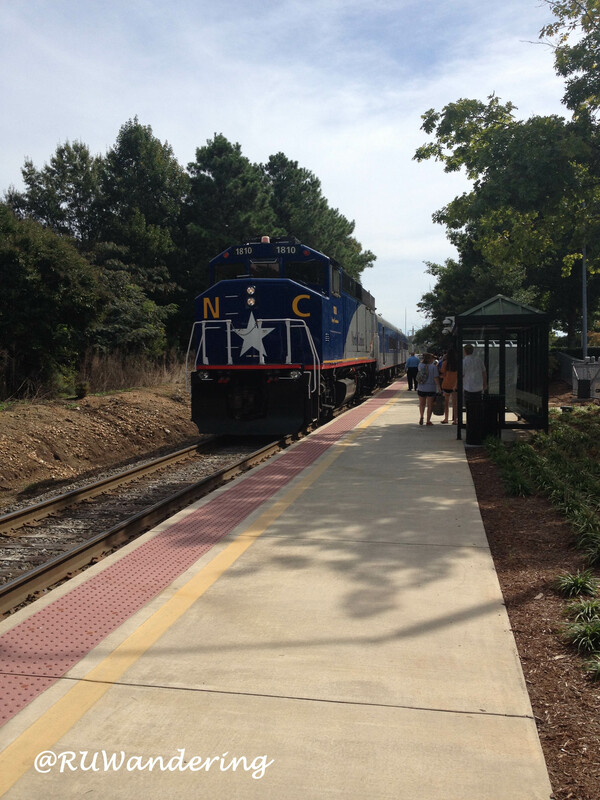 It won’t work.” But this time I convinced myself, “it will work.” What was I holding back from and making excuses: riding the train from Raleigh to somewhere. This past weekend, I saw an event in Jamestown, NC with Triad trucks and thought, today has to be the day. First I looked to see how far Jamestown was from the nearest Amtrak station, High Point. Then I looked at how I would get there by bike. About 5-6 miles, it looked attainable. So, I went to amtrak.com bought a ticket, pumped air in my tires, and drove to Cary’s Amtrak Station. Compared to air travel, checki-in is a breeze. I pull into the Cary Depot, parked my car, and walk right into the terminal. The Amtrak agent noticed my bike and assisted me with check in. Bikes need to be tagged, just like larger bags. So instead of just walking to the platform and waiting for the train, there was at most 2 minutes of check-in. The agent was very friendly and helpful and guided me most of the way. As other passengers waited toward the middle of the platform, I waited toward the front of the train. When train arrived, I loaded my bike in the baggage car and walked to the coach car. Look at the distance between my knees and seat back. I can drop something without “losing” it. Typical configuration on an Amtrak train in coach. While an airline’s first class seat is larger, a coach class seat is significantly larger than a airline’s coach seat. A blogger’s friend, an outlet to charge gadgets and mobile devices. The last train ride I rode on was the Amtrak Cascades in the Pacific Northwest, where I lined up in the terminal to get a seat reservation. But on the Piedmont, as I boarded the train, I walked up to an empty seat that didn’t have a slip on and sat down. 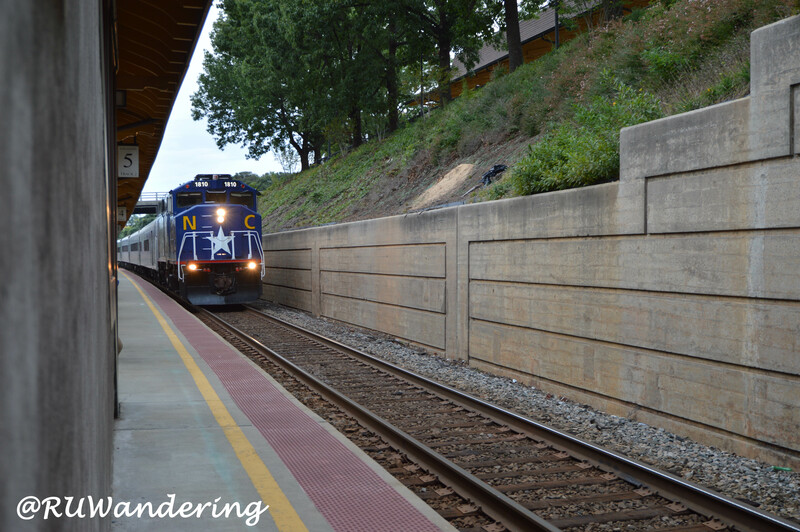 As the train left Cary, the conductor came by scanned my ticket on my Amtrak app. He grabbed a paper slip, placed it above my seat, and my seat was now reserved. Another great amenity over air travel are the seat sizes. I am not sure the actual dimensions, but lately my girth was grown and airline seats have shrunk. And looking at the pitch, my knees also are not close to the seat in front of me. So I don’t feel my knees crammed and plenty of space above to lay a bag or backpack. Though no one is sitting next to me, so I can sit comfortably with my pannier bag in between my legs. Also, I’m able to move around to the bathroom and there is a cafe car in the front of the train offering water, coffee, and vending machines. I arrive at High Point, which is my first visit since moving to North Carolina. Its more dense than I expected with lots of furniture and design signs, the major industry and what makes High Point famous. I’m here for food trucks, so I check Google Maps for directions to Potent Potables. It’s about 6 miles, which I decide to take a route that goes down the High Point Greenway. Other than the greenway the ride there was a bit advanced for biking on the road. Some parts had wider lanes for bikes and cars to share. However, some parts were a bit tight for my taste. I could be just paranoid, because I made it. But in unfamiliar areas, I felt a bit uneasy riding on a very narrow shoulder. 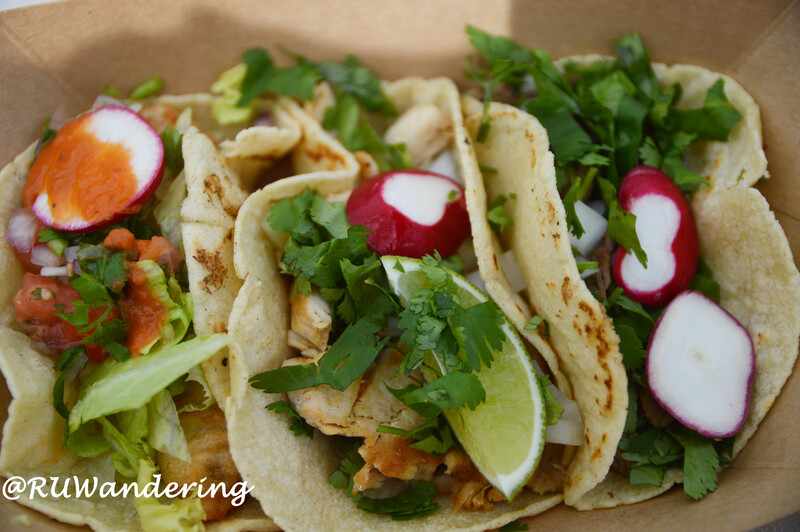 Lately, I’ve noticed a growing interest for food trucks in the Triad (Greensboro, Winston-Salem, and High Point) area. While there are trucks based in the area, sometimes Triangle-based trucks come to the area and vice-versa. I last attend the Burke Street Festival back in April and I was amazed on the attendance. With 12 truck planned for the event, I was excited to check them all out. Talking to other food truck owners, I found out this isn’t the first time Potent Potables has done a food truck fest (this was the fourth time). Also, this one location to consistently find at least one in the Triad area. Taking a breather from the festival, I walk into the shop. The shop is separated by two sections, a bar and tasting area with local beers and an enomatic station with boutique wines (they weren’t the big names you see on grocery store shelves). The other part is more craft beer and wine shop with a pretty nice selection. I was surprised, because when I rode into Jamestown, I wasn’t expecting a shop like this. Last time I had The Great Escape, I had their stir fry noodles which had lots of flavor and spice. The memory of that experience has been hard to shake off my taste buds. This time I looked higher on the menu at their savory crepes. 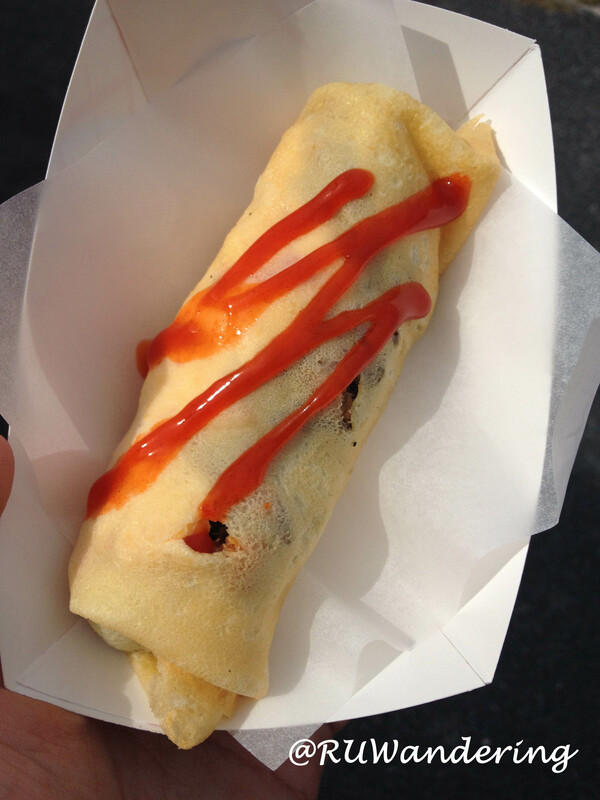 While the traditional crepe is like a huge quesadilla folded into triangular shape, The Great Escape rolls them in a style similar to a cigar. Luckily this is The Great Escape and not Cosmo Kramer supervising at the Magic Pan, so no mishaps. But I also experience a great creamy flavor with the cola braised pork shoulder, pimento cheese, and banana ketchup. It looks like my experience stays consistent with The Great Escape. Next, I tried another truck that frequents Raleigh rodeos Taqueira El Azteca. They have a “hecho en mano” (translated made by hand), which is witness with the not so perfectly circular tortillas. I ordered all the Asada (Steak), Chicken (Pollo), and Fish (Beer Battered Fried Cod). I enjoyed the fish, because it had the spicy salsa drizzled on top and the asada and pollo had a fresh catina flavor. Next time I like to add some salsa to give a bit of heat to it. Lastly, an obligatory purchase when I see Ice Queen’s white bus. 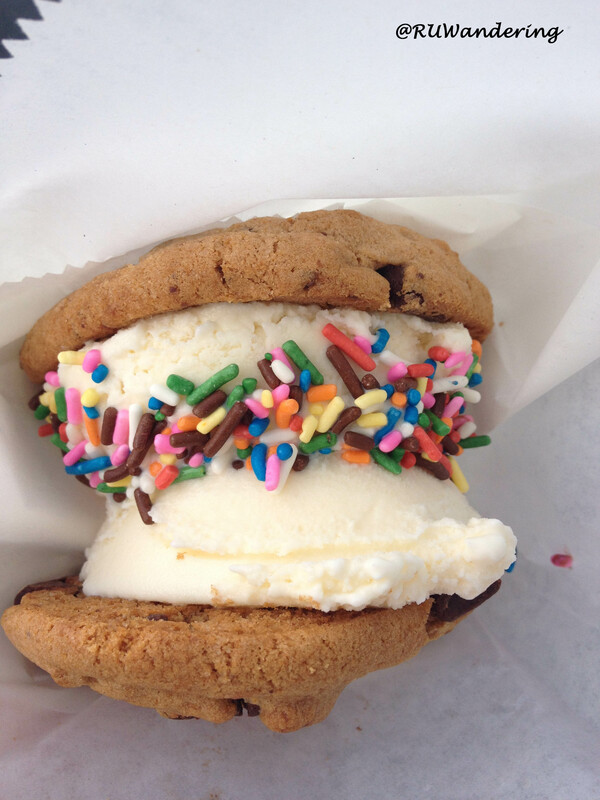 An ice cream cookie sandwich. I usually grab the E.T. which is a great mixture of peanut butter, chocolate, and cookies. Wanting expand my menu selections, I order the Der Sprinklemeister. The Chocolate Chip Cookie, Vanilla Ice Cream, and Rainbow Sprinkles is a classic with some nice texture thanks to the sprinkles. After listening to the band a bit, I grab my bike and head back to High Point’s Station. Before I wait at the station I ride around the ctiy to see High Point. I didn’t venture too far but I confirm that there is plenty of buildings that make it the Furniture Capital of the world.